Paris, La Santé Prison, 1947. 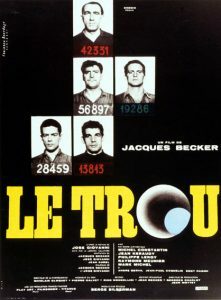 A young bourgeois, Claude Gaspard, accused of the attempted murder of his wife, is locked up in cell number 6 which he shares with four other inmates: Roland, Manu, Geo and Monseigneur. They soon divulge to him that they are digging a tunnel that will lead them outside the prison walls, through the sewers. But can they really trust him?